One of the biggest challenges of working with young fastpitch players is they continue to be young while I continue to get older. What that often means is that my frame of reference to explain things isn’t necessarily the same as theirs. Not to mention male v female — any references to Star Wars, The Lord of the Rings and similar fare usually meets with blank stares. But I digress. Tonight I was working with a high school pitcher named Maty. Getting the hang of leg drive has been a challenge for her because she didn’t use any for most of her pitching career. She’s improved quite a bit, but I know there’s still more leg drive (and speed) left in her. I was trying to think of a way to explain the idea of being explosive when an idea popped into my head I thought she could relate to. I told her she needs to come off the rubber like she’s doing a photobomb. She laughed, but she got it. So there you have it. 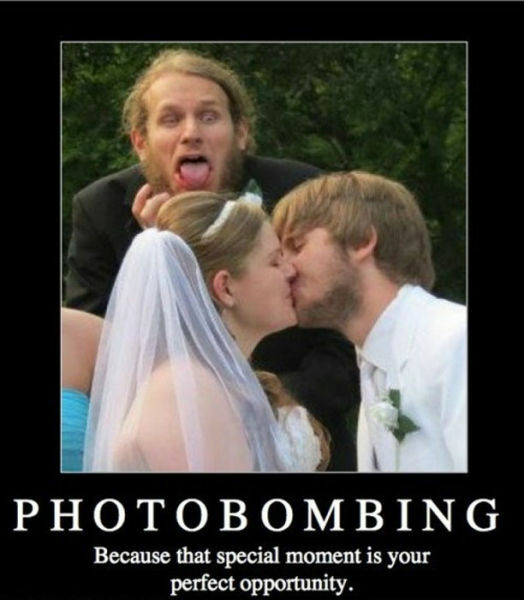 A good photobomb usually requires a quick move to get in right as the photo is shot. Posted on February 13, 2013, in Pitching. Bookmark the permalink. Leave a comment.